When you're looking for dinnerware that's stylish, functional, and eco-friendly, Cal-Mil wooden dinnerware is a perfect choice. Known for creative and useful solutions to the needs of foodservice professionals, Cal-Mil's disposable wood products feature unique designs of commonly-used dinnerware. 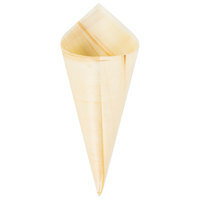 Like ordinary paper cones, wooden serving cones are disposable for easy cleanup, but they offer even more structure and durability for a display that will last. Cal-Mil wooden dinnerware is created from natural wood that looks elegant and sophisticated at any table setting. Because their wooden serving cones are disposable, they’re perfect for catered events, restaurants, and cafes that want a quick and easy cleanup. They're designed for everything from appetizers and fries to desserts and seafood. For other biodegradable products, check out our food trays, plastic cups, and straws. If you're wondering where to buy cal-mil biodegradable plates and compostable plates, platters, and trays, we have a large selection of cal-mil biodegradable plates and compostable plates, platters, and trays for sale at the lowest prices.